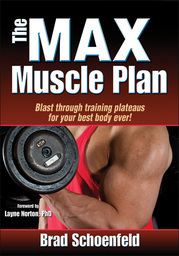 Description: Authored by 2011 NSCA Personal Trainer of the Year. Features a three-phase, six-month program for the entire body, helping readers increase their lean body mass, build muscle, and dramatically transform their bodies. Instruction revolves around MAX (Mitogen Activated Xtreme training) Mitogens being the chemical substances that encourage cells to divide, a process essential to muscle growth. Includes over 100 exercises and more than 200 photos that demonstrate the exercises and ready-to-use prescriptive program guides. Program’s goal is to systematically utilize featured exercises to enhance mitogenic and other growth-oriented training responses in a way that promotes optimal muscle development. Complemented by cardio guidelines and nutritional recommendations based on the latest scientific research. Brad Schoenfeld is famous for his research based approach to fitness and bodybuilding. I read this book because of that fact- due to my history in the sciences I’ve long been skeptical of the pseudoscience advice espoused by much of the fitness industry. This book provides a research-based approach instead, citing journal articles instead of anecdotes and tradition. That said, I did see some traditional weightlifting methods espoused in here, such as the use of 5/3/1 rep structure in the strength building phase. This book contains photos and instructions for several dozen different exercises, which a new athlete can use to craft an exercise regime. Further, Schoenfeld provides a 6-month long exercise regime frame. That regime consists of three parts: a strength building phase (2 months), a stamina building phase(1 month) and a hypertrophy phase (3 months). I plan to use his method in the six months to come. To add some constructive criticism, the author’s nutrition, cardio and general fitness sections were miniscule compared to their importance. For example, the nutrition section was exactly 10 pages. More, the author never discussed the importance of sleep at all. And some of the exercises the author did mention (e.g. Good Mornings) are controversial for safety reasons. There were glaring blindspots in the areas discussed by this guide, but I would nonetheless recommend it as a starting place if you want to begin weightlifting for size and strength.